This project originally appeared in Crafty magazine a couple of years ago. 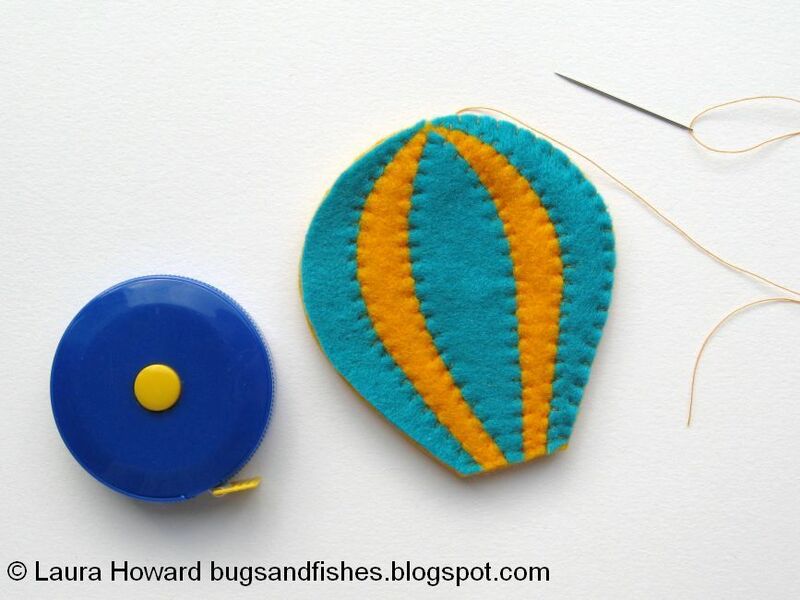 It's a really fun way to customise a plain tape measure... or you could stuff the balloon shapes instead and use them to make other hot-air-balloon-themed things like mobiles! 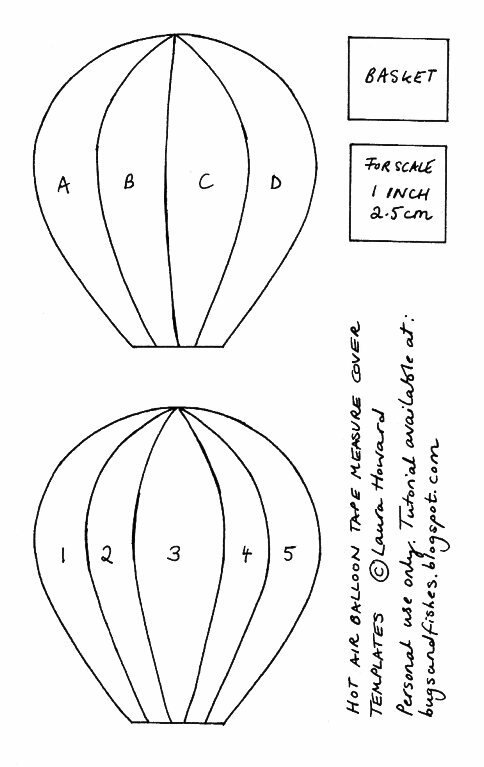 The template sheet includes patterns for two balloons - one with four and one with five stripes. The one with five stripes is a little trickier to cut and sew as the pieces are narrower and thus a bit more fiddly to work with. The steps are the same for each design. Tip: If you want to make sure that the templates are the right size for your tape measure, make a quick prototype of the cover. 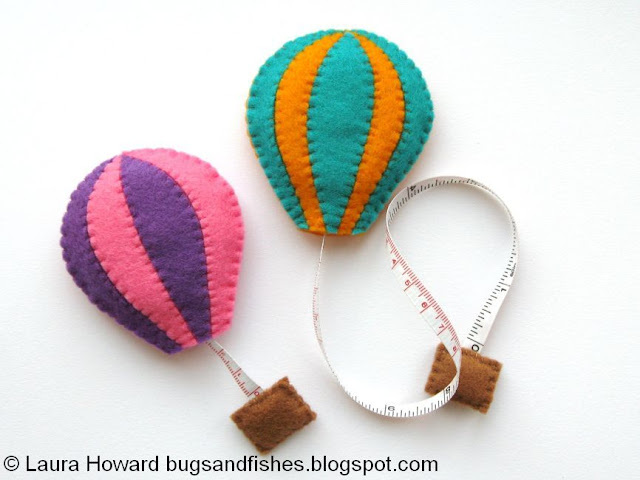 Use the hot air balloon template (before it's cut into sections) to cut out two balloon shapes from scrap pieces of felt and sew these together around the measuring tape (as in steps 4 & 5) to test that they're the right size. 1. 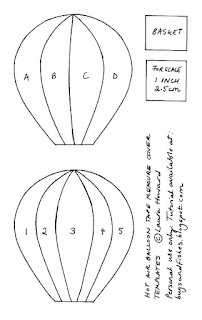 Cut out the balloon templates provided, cutting along the lines to divide the hot air balloon shape into the four or five pieces shown. Then use your paper templates to cut out your felt shapes. You could make a rainbow hot air balloon with each section a different colour or use two alternating colours, as shown in the photos. 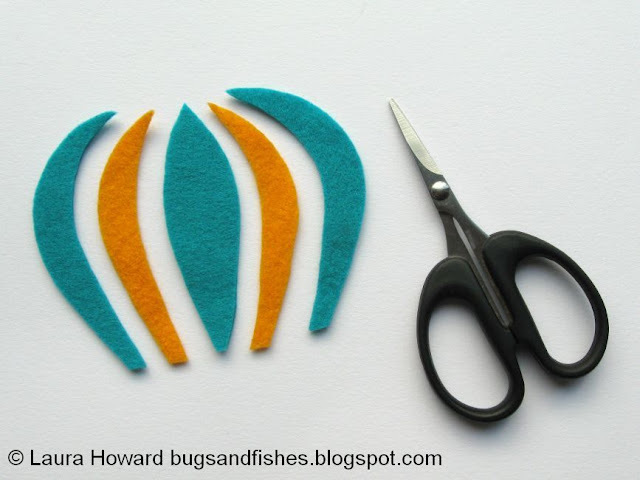 Tip: Use embroidery scissors to cut out the narrow felt shapes - the small, sharp blades are perfect for cutting out small or intricate pieces of felt. 2. Pin and sew the balloon pieces onto a backing piece of felt one by one, so they join together to form a multi-coloured balloon shape. Use whip stitch and sewing thread to match the backing felt. 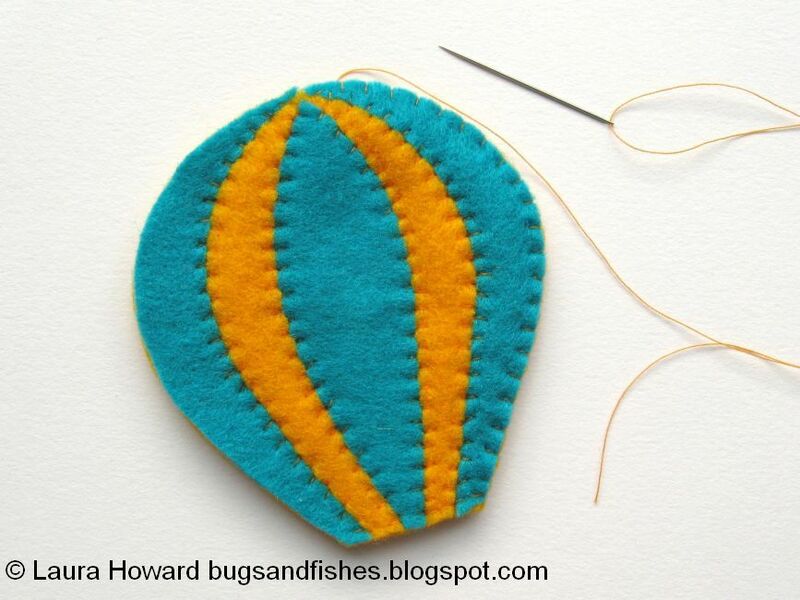 You'll be cutting around the balloon shape in the next step so make sure that you only sew along the inside edges, and take care not to sew anywhere where your threads could be snipped when you cut out the balloon. 3. 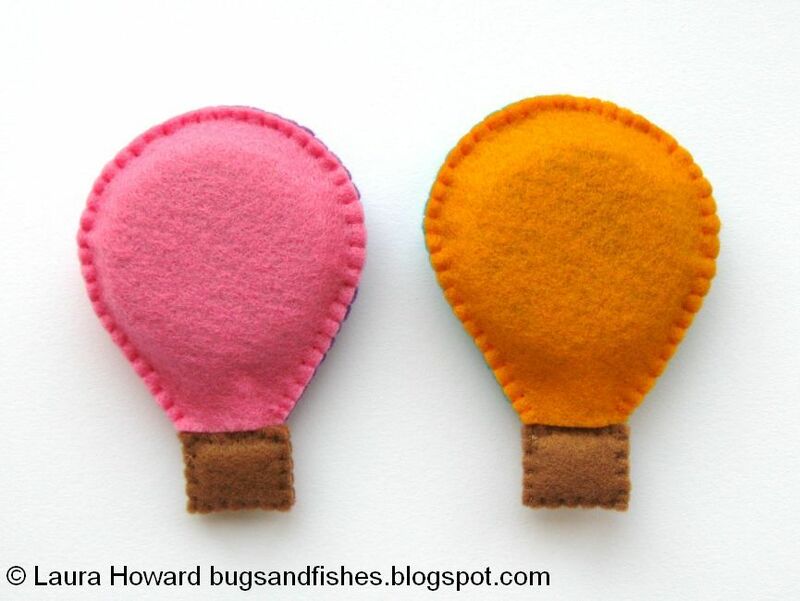 Carefully cut the balloon shape out from the backing felt. 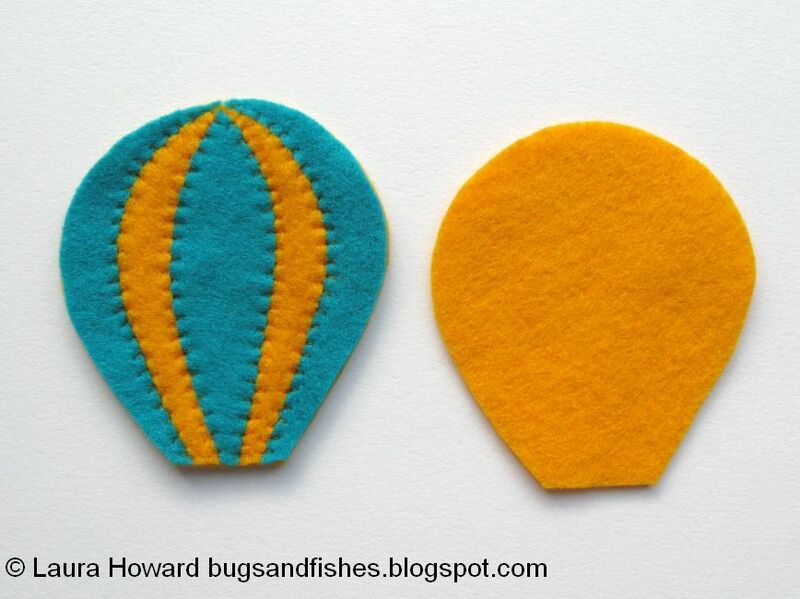 Then use this shape as a template to cut another balloon shape from matching felt. This new piece will be the back of your measuring tape cover. 4. 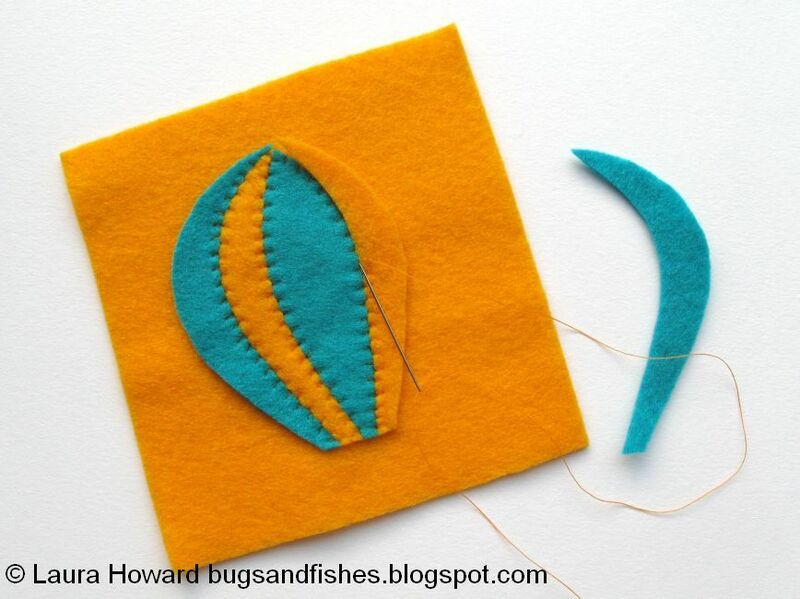 Place the front and back pieces of the balloon together and start sewing the edges together with blanket stitch. 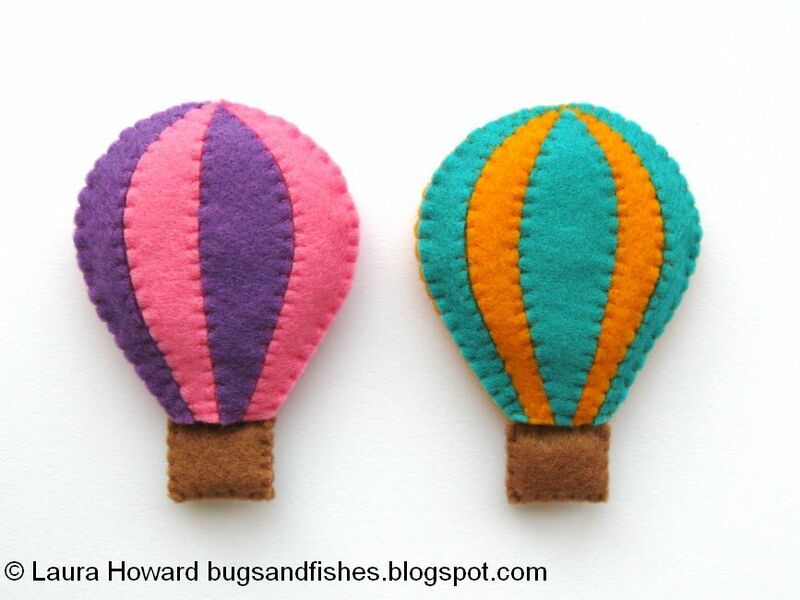 Use the same shade of thread as before and start from the bottom corner of the balloon. 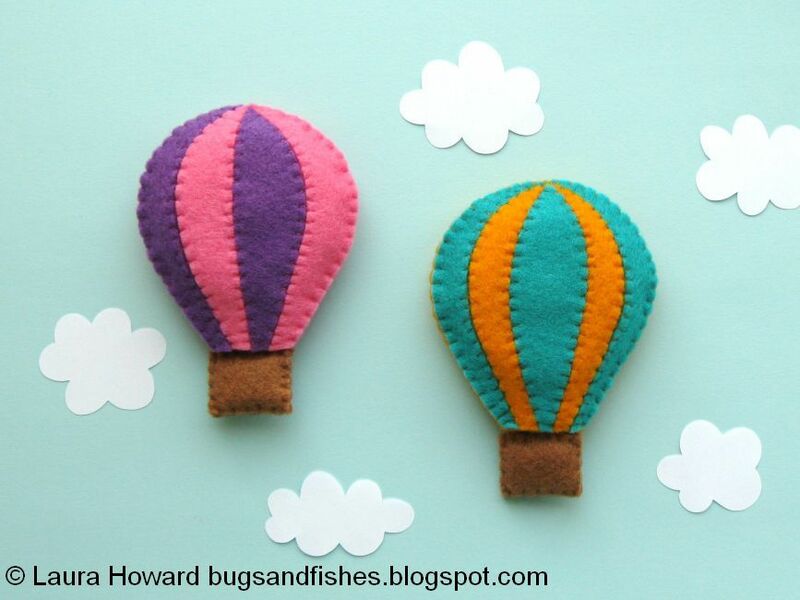 Sew up along the edge of the balloon until you've sewn a couple of centimetres (an inch) past the top. 5. 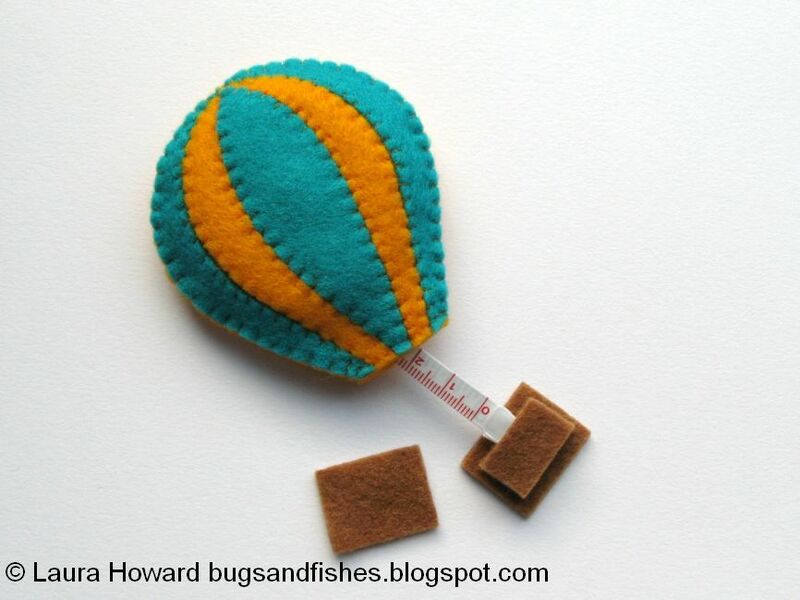 Pull out several centimetres (a couple of inches) of tape then slide the tape measure between the front and back layers of the felt balloon. Position the tape measure so the button (for retracting the measuring tape) is facing upwards and the hole for the tape is lined up with the bottom of the balloon. 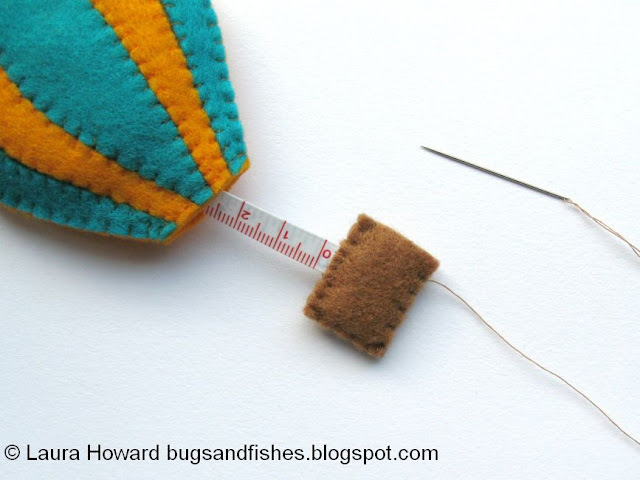 With the tape measure in place, continue sewing around the edge of the balloon with blanket stitch so that the tape measure is stitched into the balloon. 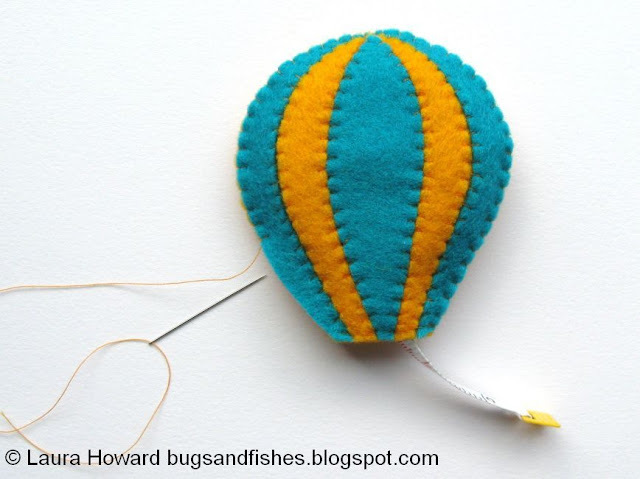 Leave the bottom edge of the balloon open, and finish your stitching neatly at the back. Tip: Take care not to press the button on your measuring tape while you're sewing it into the felt balloon! If you're worried you might do this, tie a piece of yarn or thread onto the end of the measuring tape so that if it disappears into the balloon you'll be able to easily pull it out again. 6. Cut out three basket pieces from brown felt, using the templates provided. Then cut the third felt piece in half - these small pieces will be used to pad out the basket shape to make it less two dimensional. Arrange the four basket pieces to form a "sandwich" with the end of the measuring tape in the centre. 7. Hold the felt basket layers together around the end of the measuring tape and begin sewing them together. Use blanket stitch and sewing thread to match the brown basket. Start at one side and sew up towards where the tape meets the felt. Switch to whip stitch as you sew along the top of the basket, carefully sewing through the tape to secure it to the felt. Then switch back to blanket stitch and continue sewing around the rest of the blanket. Finish your stitching neatly at the back. Click here to view the template sheet, make sure you're viewing it full size then print it at 100%. This tutorial is for personal use only: you can use it to stitch as many covered tape measures or other hot air balloon projects as you want for yourself or as gifts, but please don't make any for sale. You may borrow a photo or two if you want to blog about this project, but remember to credit me and link back to the original source, and do not reproduce my entire post or share the pattern itself on your site. Thanks! What a great idea this is!A lovely gift for a fellow stitcher.AriadnefromGreece! I have an odd obsession with hot air balloons, so I see one of these in my future! Banners, Buntings, Garlands, & Pennants!